Les Paul's resume is hard to top. Paul was a self-taught guitarist, specializing in jazz, country, and blues. He was also a prominent songwriter, luthier, and inventor. 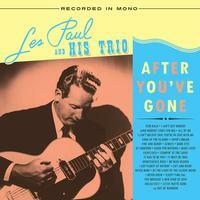 After You've Gone features an impressive 28 songs recorded by Les Paul & His Trio between 1944-1945. The double LP was remastered by Dave Gardner at Infrasonic Mastering and pressed on vinyl for the first time ever at Pallas Group in Germany.